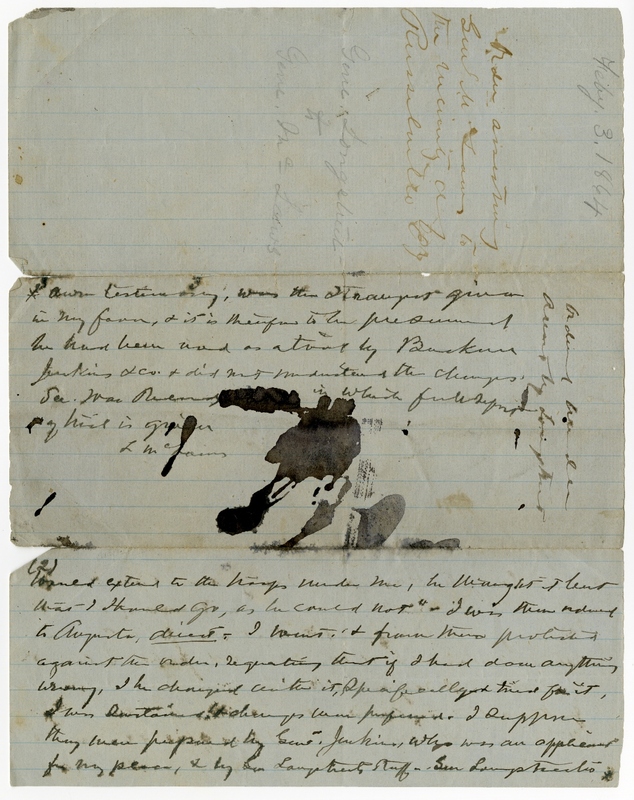 Item description: Letter, dated 3 February 1864, from General Longstreet’s Eastern Tennessee Headquarters to General Lafayette McLaws, relieving him of his command and placing him under arrest. 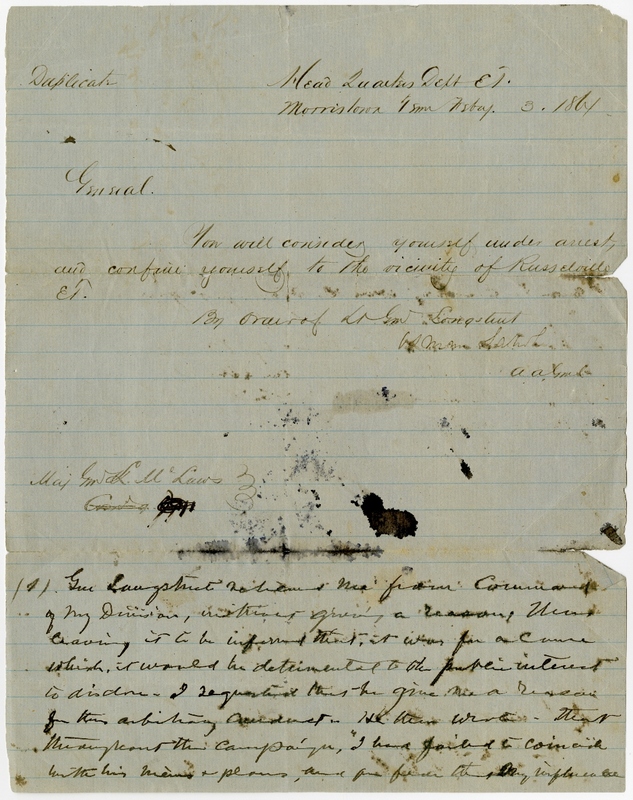 These actions preceded McLaws’ court-martial (and eventual exoneration) for failure to cooperate with General Longstreet during the Knoxville Campaign of late 1863. Beneath the order, McLaws details his actions following its receipt. Head Quarters Dept E. T.
You will consider yourself under arrest, and will confine yourself to Russelville, E.T. General Longstreet relieves me from command of my Division, without giving a reason; [?] leaving it to be inferred that it was for a cause which it would be detrimental to the public interest to disclose. I requested that he give me a reason for this arbitrary [conduct?] He then wrote that the [?] the campaign “I had failed to coincide with his [?] & plans, and a [?] at my influence would extend to the troops under me, he thought I lent that I should go, as he could not”. I was then ordered to Augusta, direct. I went & from there protested against the order, requesting that if I had done anything I be [? ?] it, specifically tried for it, I was [surtan?] it always was preferred . I suppose they were preposed by Genl Jenkins, who was an applicant for my place, & by Gen. Longstreet’s staff. Gen. Longstreet’s own testimony was the strongest given in my favor, & it is there to be presumed he had been not as [?] by [Backam] Jenkins & co. & did not understand the charges. Sec. War [?] in which full report of this is given. This entry was posted in Southern Historical Collection and tagged arrest warrants, Augusta GA, eastern Tennessee, General James Longstreet, Lafayette McLaws, McLaws Division, Morristown Tenn., Russellville Tenn.. Bookmark the permalink. ummm, this is February, not January. Fixed it. Thanks for catching the error!